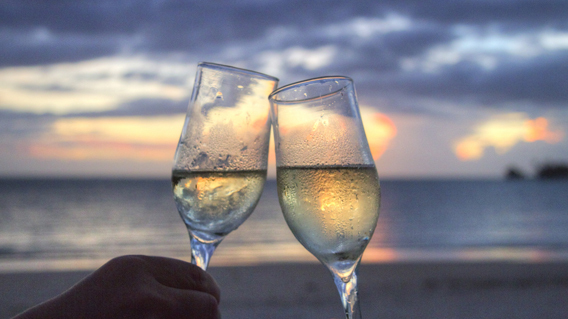 If you are planning a destination beach wedding to the beautiful Melbourne, Florida coast it’s probably worth noting that there are endless opportunities to really get your groove on and luxuriate in a “celebrity-like” experience. If posh treatment and a spare-no-expense attitude are what you want, here are some simple guidelines to help get you started. You are going to want to work with a high end wedding planner for this experience, someone who works almost exclusively with destination beach wedding planning. When you make your short list of planners to interview ask the important questions like how many destination beach weddings they plan per year and how knowledgeable are they about the high end hotels, caterers, floral designers, etc. in the area. Once you’ve got your planner picked out, it’s time to plan the fun. A real rock-star experience is going to center around some critical elements, where you stay, where you eat, where you party, where you relax, and how you get there. Limos are great…sport cars are better but for the real celebs, you’ll probably need both. Rent a maxed out limo to move your entourage from one party location to the next while you and your soon to be spouse rip down the coast in a convertible that costs more than your house (please obey local speed and driving laws). Go on a whirlwind tour of Melbourne Beach’s incredible restaurants and bars or limo the quick trip into Orlando for some serious adult fun. Whatever the case, having luxury and horsepower at your disposal will make your destination beach wedding super stylish. When you are not driving or being driven somewhere, you’ve got to showcase your bad-self like a celeb. Easily done at the many upscale hotels, restaurants, bars and nightclubs in the Melbourne area. Sure you might be a visitor at a destination beach wedding, but you’ll look right at home as you eat, drink, and party till dawn. And since you are partying until dawn, you might as well catch one of our spectacular sunrises over the beach. Just don’t let all that partying take its toll on you. And if it does, we’ve got you covered with some serious spa-like relaxation. You won’t have to look far to find incredible spas and resorts in Melbourne and the surrounding area. From hot rock massages to mud wraps beach-side, your money-is-no-object trip will be nicely enhanced with mind-centering relaxation. When all is said and done, your bank account may be a little thin, but that’s the price you pay to live in the glitz and glam of the spotlight and for a once-in-a-lifetime experience like a destination beach wedding, why not!? Enjoy your transition into the world of the married with flash and glam!